The Ross Volunteer Company will arrive in New Orleans on Sunday, February 10th, and will also stay at the Naval Air Station in Belle Chasse. They will have some free time in the Quarter that night and reassemble at the buses by the U.S. Mint building at curfew time. On Monday, February 11th, the RVs will attend our club’s luncheon at the Hard Rock Cafe’ (NOTE NEW ADDRESS) at the corner of Iberville and Bourbon (11 AM). This location is at the end of the 100 Block of Bourbon St. Hard Rock has remodeled the Storyville complex near the Brennan’s Red Fish Grill. Following lunch, they will have free time until and evening curfew. On Tuesday, they will lead the Krewe of Rex Parade as Honor Guard at 10:00 AM. This continues a tradition that began in 1951. The menu will be the Hard Rock Group Menu which will be served at a cost of $16 (tax and tip included). The choices will be the Hard Rock hamburger of cheeseburger, grilled chicken breast sandwich, veggie burger or pulled pork sandwich. These will come with fries, soft drinks and a brownie or cookie. A cash bar will be available. Club members and guests can be included in the paid meal count by paying at the event. Contact numbers are 504-491-5154 or 504-588-9880. Hard Rock Cafe’s # is 504-529-5617. As in past years, the F.D.T. will attend the Tulane Invitational Drill Meet on Friday, February 8th, on the Uptown campus. Over 70 universities and U.S. Service Academies will compete. This year’s F.D.T. will defend the National Title won last year by the Class of 2015 Team. The Fish will arrive Thursday, Feb. 7, 2013, and stay at the Joint Forces Reserve Base (BAS) in Belle Chasse. 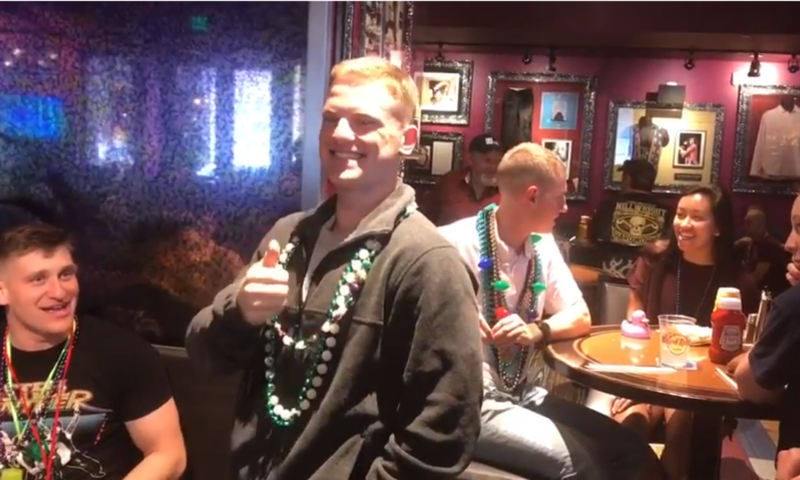 On Saturday, February 9th, our club will host the team upperclassmen, trainers, advisors and the A&M Corp of Cadets Color Guard for a luncheon at Tujagues restaurant at 823 Decatur St.. After leading the Iris Parade, the Fish will change out of uniform at the Hilton Hotel and come to Tujagues. Club members, guests and accompanying team family members can order from the menu at their own expense. No paid reservations are required. See you soon!